I started following Mig Reyes on Twitter when we played the first (EVER!) Layer Tennis qualifier match. Since then he's gone to work for Threadless, one of my vices. 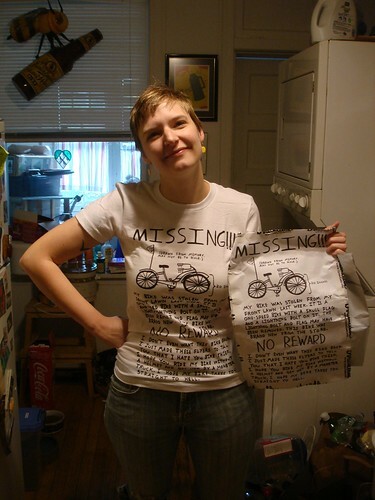 Yesterday he twittered the rather enigmatic "Missing bike means free shirts for Chicago folks" with a link to a blog post that explained that Threadless, to promote a new tshirt design that features a "Missing bike" poster, was posting real posters with the tshirt hidden behind them. Rather than make it a treasure hunt all across the city, they posted pictures and exact locations of the five they had hidden around Chicago. One of the locations was close to Shaun's work and I convinced him that he needed to take a mid-afternoon constitutional and go snag it. That one turned out to be a women's medium shirt, so Erica has a new free shirt. Whee!